Florida is an oasis for gardeners, farmers, and plant lovers alike, with unique species and a sunny, warm climate which is just perfect for America’s most popular pastime. 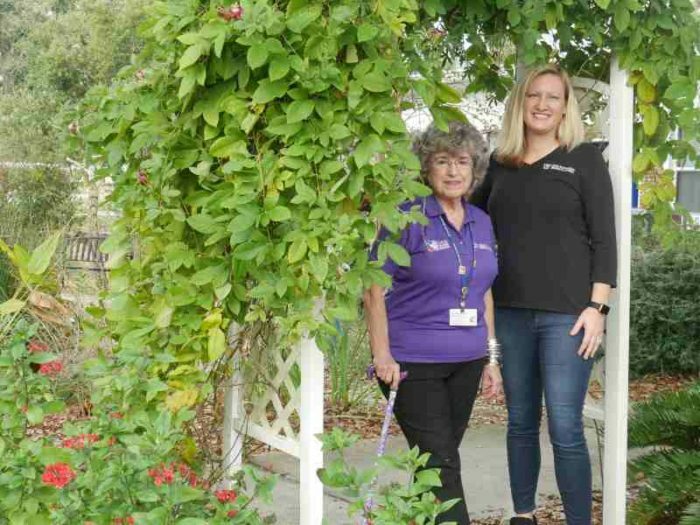 Since 1979, the Florida Master Gardener Program has trained thousands of volunteers in Florida who have worked to provide nearly $10 million dollars of service since the program’s inception. In fact, 2019 marks the 40th anniversary of the Florida Master Gardener Program. If you have never heard of this program before, you might be surprised to learn that there are an average of 86 Master Gardeners in each of our counties in Florida! You may even have some of these individuals in your own neighborhood. If you have a passion for horticulture, gardening, and expanding your knowledge and the knowledge of those around you, becoming a master gardener would be a perfect addition to your list of credentials, and it is guaranteed that your garden (and maybe even your neighbors’ garden) will thank you too. University of Florida/IFAS and local Extension office agents work in conjunction to provide individuals with a passion for gardening and serving their communities with 50-70 hours of in-classroom training which covers a variety of horticultural topics. After their training, applicants must complete 75 hours of volunteer service to obtain status as an active Florida Master Gardener. To maintain their active status, Gardeners must adhere to Master Gardener policies, complete ten hours of continuing education each year, and donate 50 hours of their time to their community every year. Some of the ways Master Gardeners can help give back to other gardeners and earn credit for the volunteer hours include: answering horticultural questions over the phone, in person or through a regular newspaper column, participating in community and school garden projects, giving educational programs to the public, supporting youth activities, performing soil sample evaluations, and certifying Florida-friendly yards through the Florida Yards & Neighborhoods Program. For individuals who want to get their program started, just contact the County Master Gardener Coordinator in your local county Extension office. So how do Polk County Master Gardeners stay busy giving back to their community? Some Master Gardeners help to maintain the demonstration gardens in Bartow, which display all of the Florida-Friendly Landscaping principles in action. Others volunteer at Polk County schools, working with teachers and students to engage interest in gardening through projects, clubs, and classes. Others may also volunteer at the Plant Clinic, where they answer calls from homeowners and gardeners with horticultural and/or pest questions. Joseph M. Wolf has been a master gardener for the last 15 years. Joe works at the Bartow extensive office in the Plant Clinic and explained that working in the Plant Clinic is his favorite way to give back to gardeners and landscapers in our community. “Most of our communications are via email, but some people do walk in to the plant clinic in person or send pictures of the plant or insect they have questions about,” says Wolf. The plant clinic also has microscopes on-site to help with identification of various pests or diseases. Joe also stresses the importance of following the #1 principle of Florida Friendly Landscaping – right plant, right place. Which part of the state you reside in can make all the difference to the success of the plant, as can soil moisture or dryness, full sun or shade coverage, or the pH of the soil. Some plants will never be able to be grown in Florida due to these factors. For example, lilacs and tulips will never thrive in Florida because it simply does not get cold enough for long enough to sustain them. Master Gardener Betty Harrison also provided some helpful tips that could only come from an experienced Florida gardener. “Plant crape myrtles. Plant them around the garden and around the farm. The crape myrtle may well be the most important woody landscape plant in Central Florida for sustaining beneficial insects because it is considered a banker plant. Crape myrtles not only attract pollinator insects but also an aphid that only attacks crape myrtles. That aphid, in turn, attracts predator insects like lady beetles and parasitic wasps. After feasting on the crape myrtle aphids, these predator insects search for other harmful insects in the garden. Voila!Free garden pest control,” she states. Betty also stresses the importance of planting pollinator plants that thrive easily in Florida, such as pentas. She divulged her recommendations on which plants can withstand different soil types and little to minimal supplemental irrigation and are ideal for beginning gardeners here in Central Florida: pentas (red/pink/lavender butterfly bushes which flower year-round), coontie cycad (native to Florida with compact size and the ability to grow in full sun or full shade), and herbs, such as mint, oregano, and parsley, which are easy to grow in compact spaces, a great start to growing your own food, and the perfect way to spark kids’ interest in gardening. Another helpful resource for all Florida gardeners is Florida Friendly Landscaping. Julie Schelb is the Florida Friendly Landscaping Coordinator for the Polk County and Southwest area. Schelb expressed that Florida Friendly Landscaping is an integral part of the Horticulture Extension Agency and work very closely with the Master Gardener Program. “Florida Friendly Landscaping is an important resource for any Florida gardener because it helps to dispel the myths of gardening while helping gardeners be environmentally conscious of the products used for the benefit of both their garden and the environment. For new residents in Florida, gardening can be very different from what they may have been used to,” explains Schelb. She cited the nine principles of Florida Friendly Landscaping as the most beneficial guide to getting a beautiful landscape that is also environmentally conscious that can be enjoyed by all. The Florida-Friendly Landscaping™ Guide to Plant Selection & Landscape Design are specific to your Polk County yard. Anne also stressed the importance of following the principles of Florida-Friendly Landscaping, as well as attending the classes and workshops offered by the UF/IFAS Extension offices. “The essence of the program is to provide research-based solutions to residents on topics of gardening and landscaping,” she says. If you happen to know a Master Gardener or Florida Friendly Landscaping employee, thank them for the time they take to beautify our surroundings here in Central Florida!